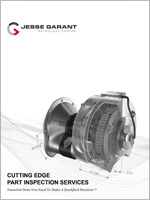 Jesse Garant Metrology Center understands the versatility of molding and meets this challenge with continued investment in inspection technology. We are the NDT lab manufacturers trust to inspect and validate their molded parts to ensure quality standards are met with every product. With a full suite of advanced imaging options, we provide critical inspection data for all stages of molding, from design to quality control. We’re equipped with the greatest diversity of industrial computed tomography systems in North America, including a high-energy CT system for rapid mid-size to large part inspection. For even more imaging options, we also have radiographic testing systems and 3D scanning capabilities. Our diverse NDT systems handle testing of complex molded parts of a range of shapes and sizes. We can inspect a variety of materials, including elastomers and thermoplastic polymers as well as metal alloys commonly used for molding. We test parts made from different molding processes, including blow molding, plastic injection molding, metal molding, reaction injection molding, multi-color molding, and thermoforming. We also conduct inspection of welds made from a variety of techniques, like hot plate welding, fused welding, and sonic welding. Our industrial CT services accommodate a variety of inspection needs for molded parts during pre-production, including identification of porosities and verification of wall thicknesses and fit and function. Our process ensures the consistency of first run parts by qualifying complex geometries to tight tolerances during First Article Inspection (FAI) for PPAP and AS9102 Form 3 reporting requirements. Another useful option for external inspection is 3D scanning. While can be a daunting task to ensure molding processes are running optimally, the inspection data we obtain using CT gives valuable feedback of production processes. Nondestructive testing at specified intervals can qualify parts before reaching their destination to satisfy customer expectations. Industrial CT can also provide first article metrology data during production and 100% inspection of high value, limited run molded parts. Industrial x-ray is highly suitable for large volume inspection of molded parts and components, taking out the guesswork during quarantine or recall situations. Our inspection process is traceable and repeatable, isolating suspect parts and reintroducing good parts back into production. Industrial CT is another option for sorting of molded parts with complex inspection requirements. Molded parts are highly customizable, but are prone to accumulating internal failures that can be difficult to detect without destructive testing. 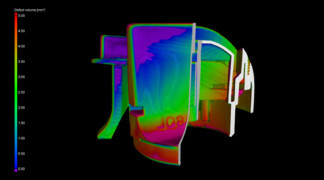 But with industrial computed tomography, manufacturers identify a variety of external and internal defects while preserving failure conditions. CT identifies and characterizes defects like warpage, shrinkage, porosity, cracks, knit lines, flash, and other production problems.